The Columbus Landscape Association was the first sponsoring group to donate a section of the garden. Plant materials, landscapes, irrigation, and countless hours of time has been donated by member companies of the CLA, with additional plants and services provided each year. The CLA includes local independent landscape designers, growers, installers, green industry suppliers, and landscape maintenance companies, many of whom are OSU alumni. 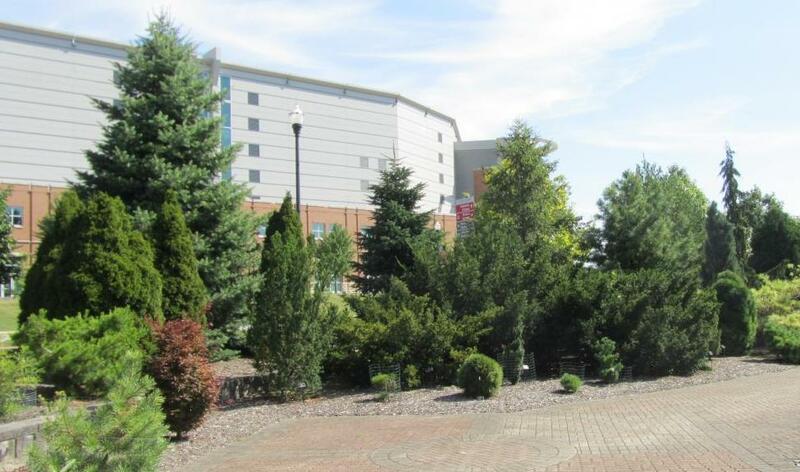 The Schottenstein Center forms a dramatic backdrop to this conifer collection used extensively in the plant sciences teaching and research programs. For many years the CLA sponsored an annual student internship scholarship. Donald Moulton was a member of the CLA and promoted the importance of providing internships for students. An internship scholarship in his name was given annually for a number of years and the CLA followed his lead. These scholarships are dormant now, but they helped to jump start our early efforts to engage horticulture students in the care and maintenance of Chadwick Arboretum. The Columbus Landscape Association continues to provide annual monetary support to our gardens. Yearly, the CLA holds one of their monthly meetings in the gardens at Chadwick Arboretum as well as participating in garden tours. Many of their members are graduates of the Ohio State University and enjoy visiting their alma mater. In addition, the Ohio Nursery Landscape Association members, state-wide, provide support by donating plant material for our Spring Plant Sale and Auction, our major fundraiser. The dragon's eye Japanese red pine (located west of the Barbara Jean Johnson brick walkway) is one of the most striking species of conifers in our collection. This is an unusual tree with horizontally variegated needles in bundles of five that create a creamy look to the plant. Relatively slow growing to about 40 feet, the specimen plant can easily find a place in the garden. The soft yellow color of the needles intensifies in the summer and would look spectacular with many of the plants that frequent gardens, such as the silvery blue tones of Russian sage or set against a solid green background of another conifer such as Norway spruce. 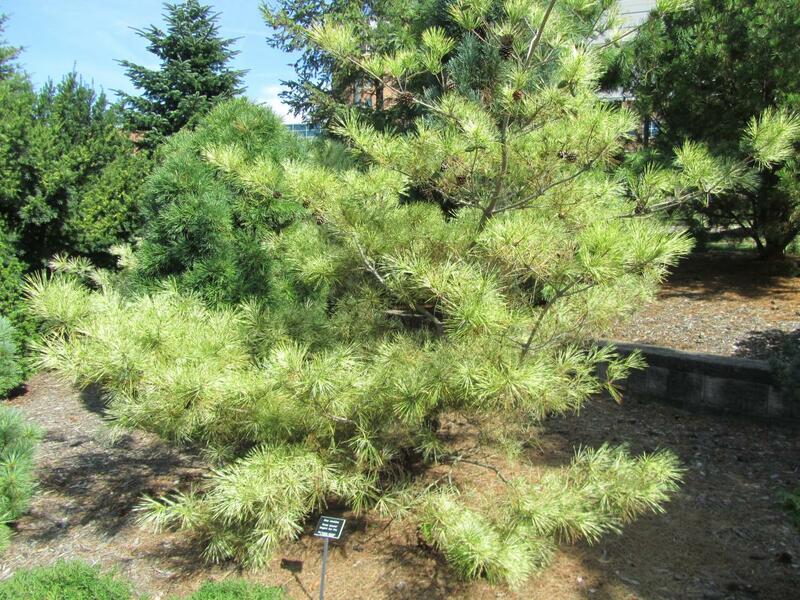 In addition to the wonderful color and texture of the foliage, the dragon's eye pine also has great bark appeal. The bark is thick and cracked, revealing orange and cinnamon colors. The lower limbs can be removed to better expose this beautiful ornamental feature. Put this plant in full sun and in moist, well-drained soil. It is relatively problem-free; just don't plant it near a road because it is not salt-tolerant. 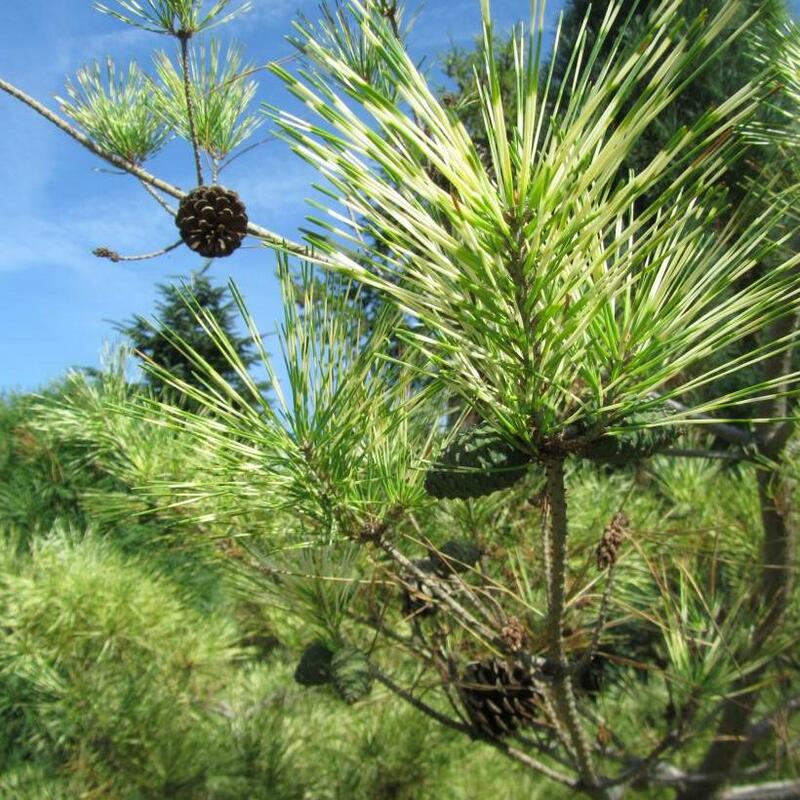 Click on Pinus densiflora for a photograph and one or more links to information about this tree from The Ohio State University Plant Facts, Wikipedia, and/or USDA Plants Database. Or click Plant Search Database and simply enter the botanical name (genus only will work) of any tree on The Ohio State University Columbus campus. If you do not know a tree's botanical name, you can find it by searching the web using the tree's common name. We are in the process of adding QR codes to our plant labels throughout the arboretum. If you are walking in the gardens and see a plant label with a QR code, use your smart phone or tablet QR reader app to access a photograph and description or link to additional information about the tree. If you don't have a QR reader app, you can download one for free from your app store.